^ if you scroll down to the bottom of the page youll see they toggle how they toggle. 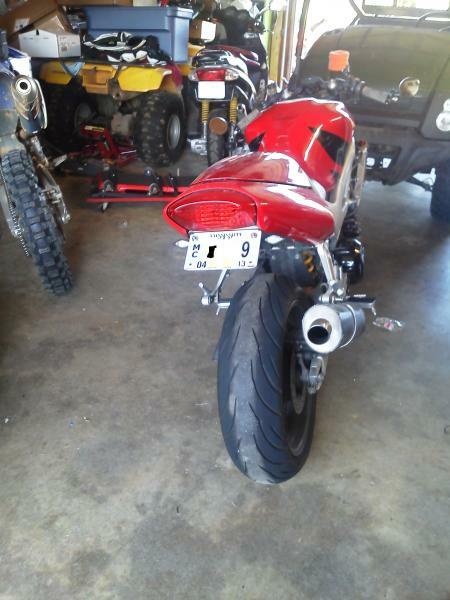 PLEASE give me a link for those tail lights and what kind of modification you did to your tail to make it look so smooth. Saw on your youtube that you did a cbr600rr dash swap. Do you have a guide for this? I have been wanting to do that for awhile. Already have the 07 cbr dash set up to install from my girlfriend’s previous bike. For the swap, you better really be committed and take you time. All the wires correspond but you need the temp sensor from the dash. You also need a fuel tank float. You can use the 2nd gen vtr float (way easy) or do what I did and get the cbr float and graft it in. (thats the real hard part). You are dealing with wiring inside the gas tank and sealing the bottom of the tank so alot at risk. The vtr float has a different resistance range so you will never get the whole number of dash bars to work, which I wouldnt be happy with so plastic welded my own float. Look up my thread on here about it. I think I tell all. I do recommend getting stock type connectors so you can unplug the whole dash and replug the stocker. I cant tell you what an improvement it is having digital speedo, clock and temp, and forget about how nice a fuel guage is. I also since added an ambient air temp thermo and voltage/charging guage. 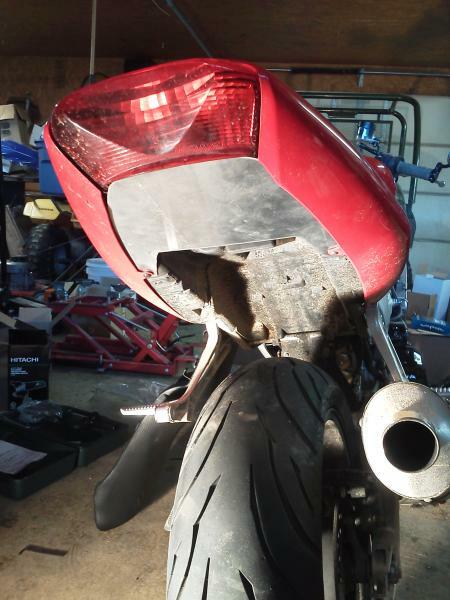 After losing an auction on a pair of CBR1000 rear turns I found a set of CBR250 turns for next to nothing. I liked them, but thought it could be better. Another set of 1000 turns came up for auction. The 250 turns wiring was plug and play. The mounting required some fiddling with washers to get bolted up. The 1000 turns bolted up perfectly, but they have HC050 connectors. The turns came with both sides of the connectors and about 6" of wire to where it had been cut. I added a 3.5mm bullet connector on the end of that length and that plugs directly into the stock SH harness. The wire on the 1000 turns is really small, maybe 22g. Makes me wonder if the rest of the CBR1000 wiring is tiny as well. OK, I have the crappy old Lockhart aftermarket front turn signals on the Hawk. I purchased ebay mirrors with turn signals built in, but I have to decide what to do with the stock mount point holes. I'm looking for nicer turn signals to put back on in place of these, something flush-ish, or a good block-off plate idea. Pictures of your suggestions are great!! Last edited by FTL900; 10-01-2015 at 12:04 PM. I have just left mine open. Doesn't look bad. Watsen Design. The best by far. The fairing is currently off, so I haven't mounted them up yet, but they do look good and cover the hole nicely while not sticking out. And I'm not sure how noticeable the mirror signals will be from different angles. I already have a flasher replacement waiting in the toolbox, so flashing speed wont be a problem. Can you post up the link for those blinkers? You can get them in red or in yellow, depending on placement. Like I said, I haven't tried mine yet, but they do cover the hole well and look... minimalist, not obtrusive. Here is the flasher required for LED turn signals. It's $8.95 plus shipping, and on my Bandit, I unplugged the OEM flasher wiring and plugged this right in. Then your signals work right again. No wire cutting or crimping required. Edit: Minimal wiring changes were required on the SH. My Bandit was a straight plug-n-play connection. Last edited by FTL900; 01-13-2014 at 05:53 PM. 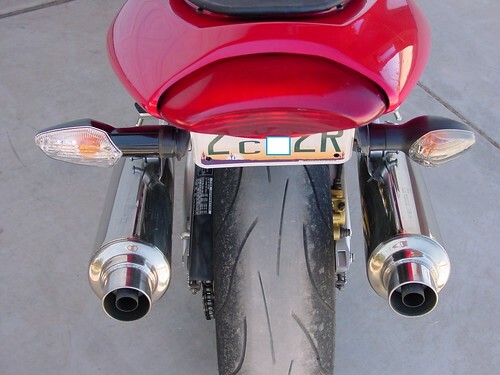 Since there is interest in these turn signals, I figured I better plug them in and see if they're worthwhile. The longest side of the signal is right at 4 inches long. 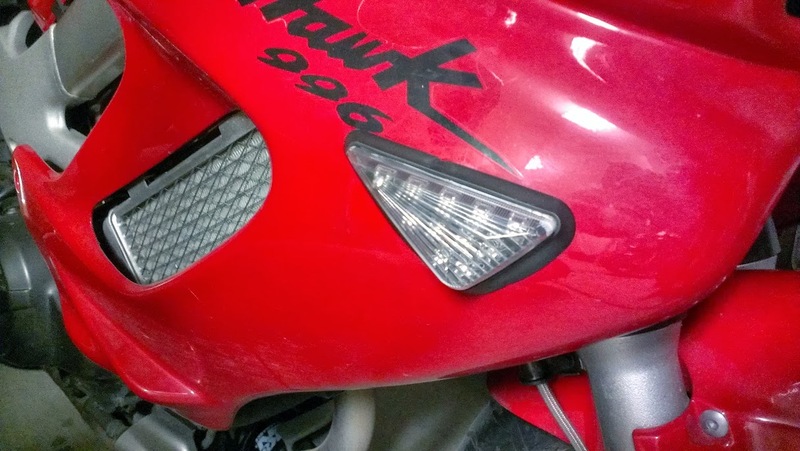 I have them mounted up on my Superhawk working with the cheap turn signal mirrors on ebay. The idea is to use both at the same time for more exposure in traffic. I'm very pleased with how it turned out. Here's how it looks with the mirror signal and the flush mount signal mounted. I'm actually quite surprised how much light the flush mount kicks out to the front. I kinda put the lighted mirrors on because I wasn't real confident about the flush mount visibility to the front. 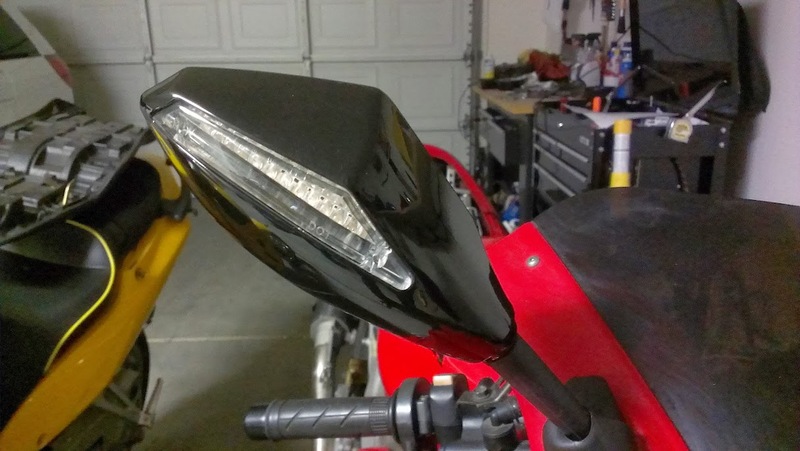 It really kicks out a lot of light in every direction, so I'm very pleased, and may order another pair of these for my VFR, which has OEM flush mount signals the size of Mt Rushmore. Note: If you mount these mirrors up, be sure to include a polarized plug or bullet connectors in the wiring, so you can remove them when the fairing comes off. One other note is they're not real tight. I'm in the habit of hanging my helmet on the mirror, and when I do it with these, the mirror sags. I'll look into tightening it up. I also added the previously mentioned Super Brite LEDs to the dash. The SH takes 9, but I goofed and only ordered 8. Anyway, it's much brighter with a faint bluish tint. My VFR has the same bulbs (only 5 of them), and it was previously a very dim dash at night- bordering on unreadable except studying it closely while at a stoplight. Here's a link to the LED lights. $2.59 plus minimal shipping. I chose the first color option, the light blue with the wide 90 angle for maximum gauge lighting. Last edited by FTL900; 01-26-2014 at 06:19 PM. With permission from both original posters, I merged 2 threads. There is a lot of info contained within, so I decided to combine and sticky 1 thread in an effort to organize info. I would also like to edit out some non essential posts 32, 36, 39, 41, 42, 43, 54,55. If anyone has objections, please reply. Like stated, I'm just trying to streamline the thread. If you feel your post needs to be restored, lmk and I will. Also a big thank you to everyone that contributed here. +1 for keeping all the pics in their original locations so everyone to continue to see them. Last edited by Wolverine; 12-06-2013 at 08:21 AM. Feel free to move, edit, combine, or delete anything non-essential from me, including this post. My post above is updated. I accidentally deleted some of the linked pictures, so I have replaced them with the current images showing mounting and operation. 3 separate purchases; the mirrors, the flush mount turn signals, and the dash lights, and I'm very pleased with each of them. 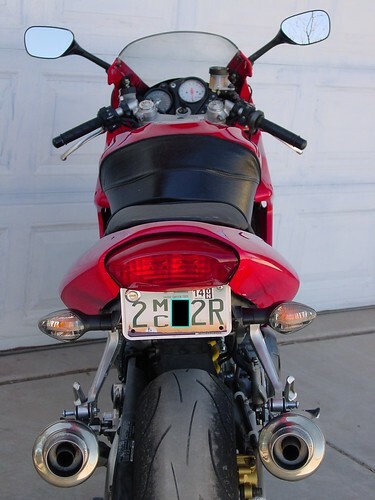 I expect I'll probably buy another mirror set for my VFR, and maybe even clone the flush mount signals over to it as well. My name is Michael, and I approve this message. This is a great thread and a mod I’d like to do soon. Firstly I’d just like my standard indicators to flash when Iflicked the switch! Sometimes they do and sometimes they don’t. All connectionsare tight and well earthed. There doesn’t seem to be a pattern to them workingor not although the LH side works more consistently than the right. Found these anyone use these. They say it fits the SHawk. Would you still need the eagerbeaver kit still? Also who can tell me what the stock headlight is? 9003 or HB2 bulb can be referenced to H4. HB1 bulb can be referenced to 9004. HB3 bulb can be referenced to 9005. HB4 bulb can be referenced to 9006. HB5 bulb can be referenced to 9007. 9008 bulb can be referenced to H13. 9145 bulb can be referenced to H10. 5202 bulb can be referenced to H16. 880 bulb can be referenced to other 800 series bulbs. Stock bulb is an H4. You don't want to plop an HID bulb into a stock VTR reflector and be done. Do some searching, you'll find pictures of the results. Wolverine why can't you just use the hid kit for the SH? The Web site I found has the kit says it works for a SH. Below is the kit I found let me know any feed back what mods would I need to do to the housing? So everyone is saying to use a HID kit for the standard SH light housing you need to buy a new projector/reflector? Anyone have a link to what this will be. 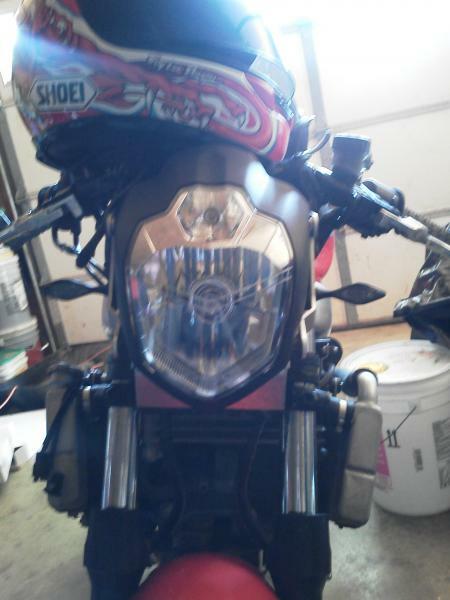 The whole bike is ready to go back together but waiting on the upgrades for the headlight. Please help your guys rock! The reason this is needed is that HID and halogen bulbs emit light in a completely different manner, so a reflector designed for one will not work for another. The projector is a unit that is physically put into your housing (read: more DIY involved than just splicing some wires). Plenty of other threads discussing this. I'll do yours for $2500 / no time guarantee. I'll make all my mistakes on yours before doing my own.